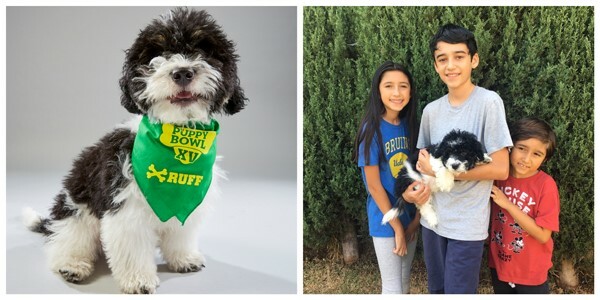 Los Angeles, CA (2/1/19) -Shelter pup, Shy Boy is representing Society for the Prevention of Cruelty to Animals Los Angeles (spcaLA) in Puppy Bowl XV, America’s cutest annual sporting event on Sunday February 3rd on Animal Planet. Tune in and cheer for Shy Boy and Team Ruff! At four months old, Shy Boy flew to New York City to go nose to nose with puppies from all over the country. While in the Big Apple, Shy visited some of the city’s most iconic sites, including Rockefeller Center, the New York Public Library, 42nd Street, St. Patrick’s Cathedral, and HBO. Upon returning to Los Angeles, Shy Boy was adopted and lives locally with his family. Shy Boy’s flight and hotel accommodations were generously donated by Orbitz, the travel booking website, where millions of consumers search for and book a broad range of hotels, flights, car rentals, cruises, vacation packages and destination activities. The Puppy Bowl features shelter or rescue puppies exclusively to encourage pet adoption. spcaLA has participated in Puppy Bowl since 2012. Fumble, spcaLA player from Puppy Bowl VIII was voted MVP – Most Valuable Puppy. Meet your own MVP at an spcaLA pet adoption center today!